— This article by Jerry Cates and Becky C., first published on 15 June 2010, was last revised on 24 April 2016. © Bugsinthenews Vol. 11:06(02). 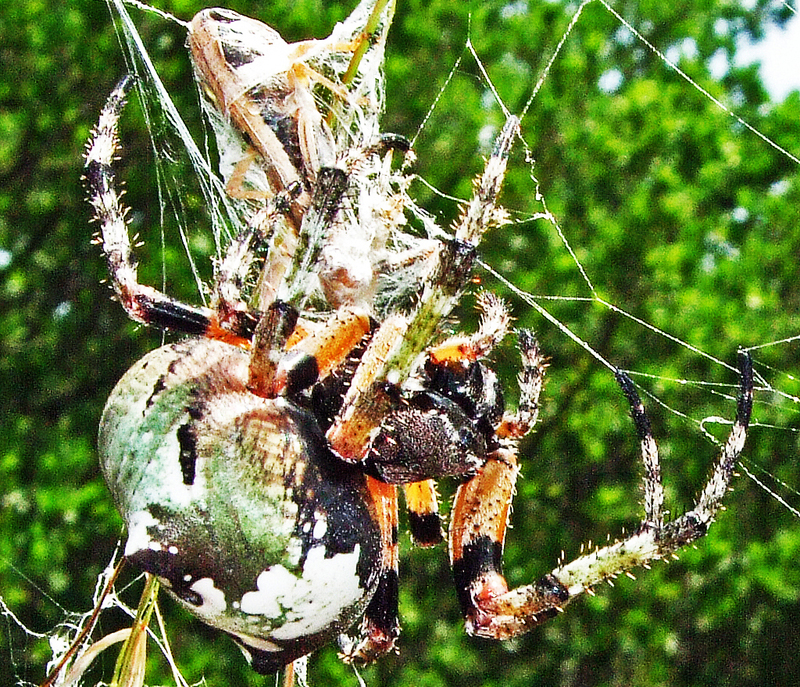 Becky wrote that she had found a giant lichen orbweaver (Araneus bicentenarius) on her property near the Texas city of Burnet. The photos she sent were stunning in their clarity, as you will note. Furthermore, each was sent at a high resolution, which allowed me to crop and enlarge certain portions to illuminate important anatomical features. Each photo is linked to a larger view, which you may examine by simply placing your cursor over the photo and clicking on it. 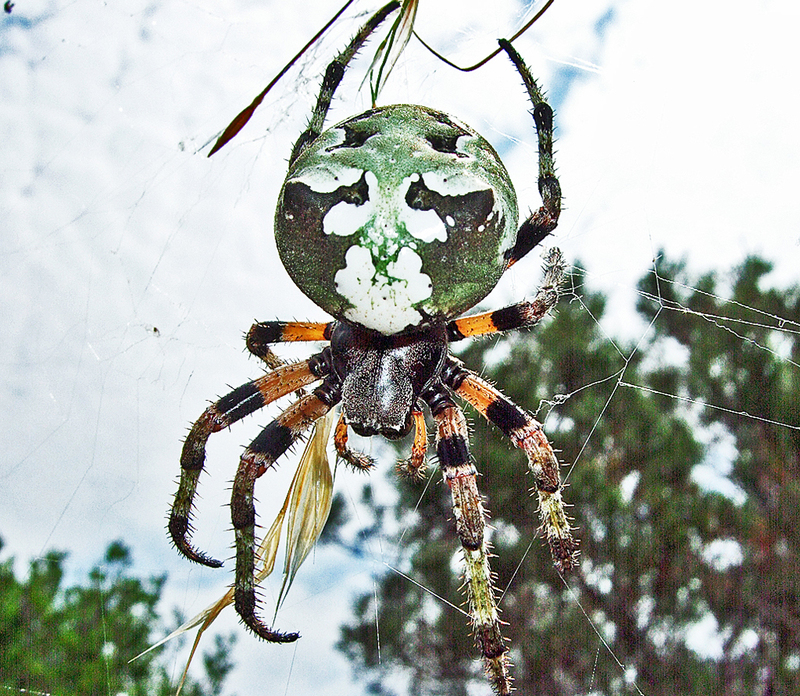 This spider is among the showiest of the orb weavers for its striking colors as well as its behavior aloft. The dorsofrontal view shows this female after she has immobilized a grasshopper with silk and, most likely, after she has also injected its body with a paralyzing dose of venom that will quickly reduce its internal tissues to a liquid soup that she can siphon off later. Photographs of the epigynum of this species show a scape in the form of a slender, curved finger of chitinous material. This enlargement, taken from the ventral view Becky provided, shows the scape in bold relief. 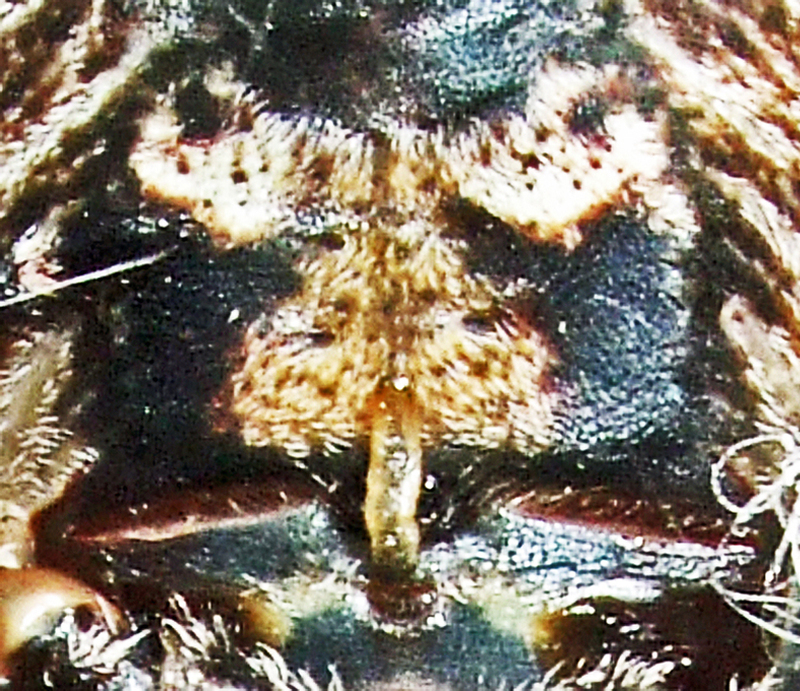 The ventral mark for the species is distinctive. 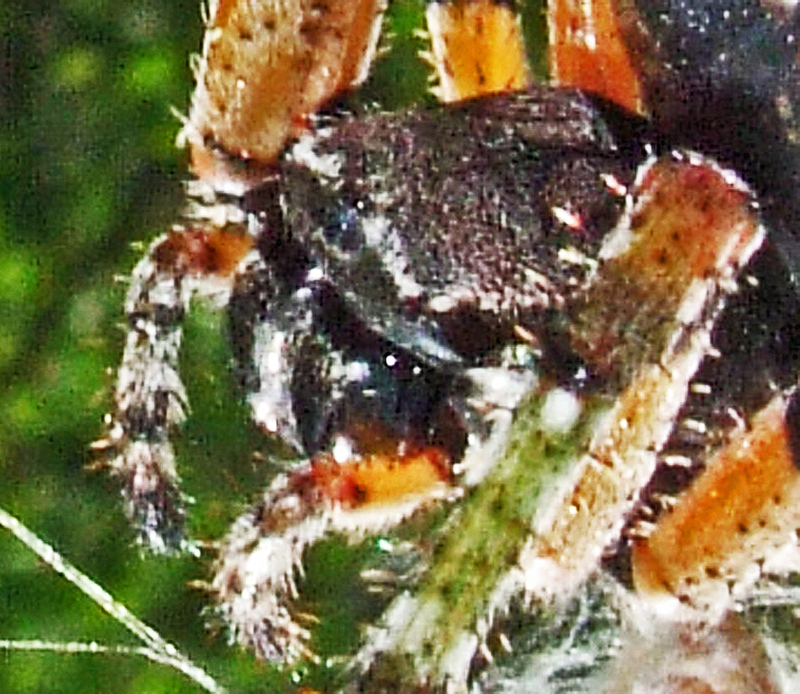 Spinnerets are six in number, anf four can be seen in that photo. 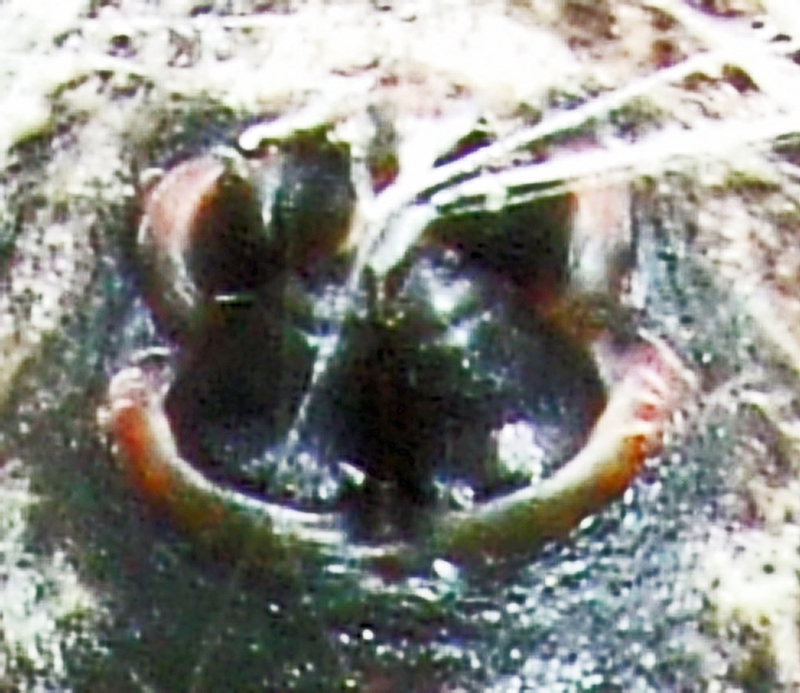 Two smaller spinnerets are hidden between from sight. 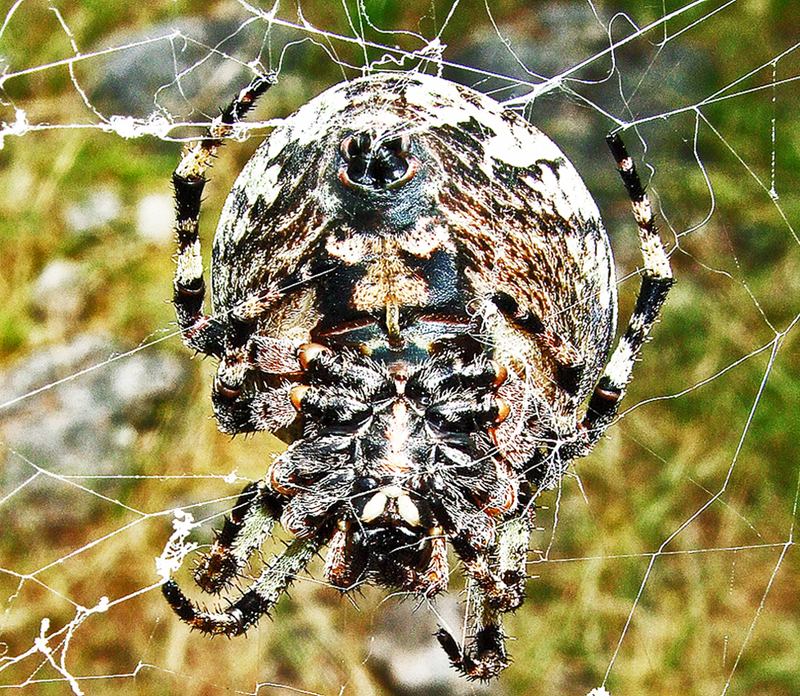 I live outside of Burnet,Texas and almost drove my mower through the web of a Giant Lichen Orb Weaver this morning. I have taken numerous photos, but none show the eyes. (I was using my iPhone5, as my Canon’s batteries are dead (wouldn’t that just figure?!). If you would like to see some of my shots, let me know and I will be happy to send them to you. I have a few of the spider on its web, which somewhat makes it look like an alien in midair~as well as several of it on the end of an oak limb. I had no idea what this spider was until I found the lady’s (the one who is also from Burnet..how ironic!) pictures on your site.